Across Saigon, you’ll see ads for Mekong Delta tours splashed across shop-fronts, especially in the Pham Ngu Lao backpacker district. And after hiring a guide for the Cu Chi Tunnels, canyoning and motorbiking, I decided to venture to Vietnam’s “rice basket” on my own- no more hand-holding. Because who needs a $10 guided tour when you can DIY it? Luckily a cool Australian guy from the hostel was also up for a delta-adventure. And let’s be honest- some journeys are just more fun with a fellow Vietnam and beer-loving traveller in tow. The first hurdle of DIY-ing the trip was simply getting there. After the bumpiest, most uncomfortable bus ride I’ve ever taken in Southeast Asia (sans AC, mind you), we arrived in the quaint riverside town of Mỹ Tho, the so-called gateway to the Mekong Delta. Awkward selfie on the back of a motorbike. At least I was wearing a helmet! By the time we had arrived I had gone a full four hours without phở so I was starting to get cranky. But soon I was sitting in front of a hearty bowl of bún riêu cua– a rice vermicelli soup with unknown meat specimens inside. While not quite as delicious as my beloved Saigon-style beef phở, it was a good first taste of the Mekong Delta where the dish is very typical. Mỹ Tho is my favorite kind of Southeast Asian town- one rich in ambiance but not attractions. Without the self-inflicted guilt-trip of the “things you have to do”, we simply strolled the canals, stopping every so often to sip Vietnamese coffee. After a few hours we retreated from the heat and spent a few hours watching Vietnamese game shows in our swanky, $10 each hotel room. And then we headed out to the night market. While Mỹ Tho is a town that sees its fair share of tourists, almost all of them are day-trippers; by night we had the town completely to ourselves. And imagine my delight when we discovered the night market specialized in seafood; piles and piles of local, dirt-cheap seafood. The group loved when we lifted our beers to, “Một hai ba, yo!” which means “One, two, three, drink!” and is how you cheers in Vietnamese. Our new friend showing us how to crack crabs. And it really kind of was. And then on the way home a shopkeeper invited us into his home for a beer and talked about the Americans guys he met during the war. I love Vietnam. The next morning we hired a boat-driver to show us the Delta. And after paying way too much, (about 250,000 dong each, or $12) we had ourselves a humble river-boat and a private guide. On the river I noticed most of the boats had googly-eyes painted onto the bow. With the lush jungle growth and muddy waters, I felt like I was exploring the Amazon. then we stopped at an alligator farm. The whole exhibition seemed cruel; tourists holding pieces of meat on fishing rods and bonking the alligators on the head repeatedly. Why is that necessary? We made a few other lame stops but the real joy of the journey was just sailing across the waters. And as I learned from my EasyRiders tour, sometimes the journey means so much more than the destination. 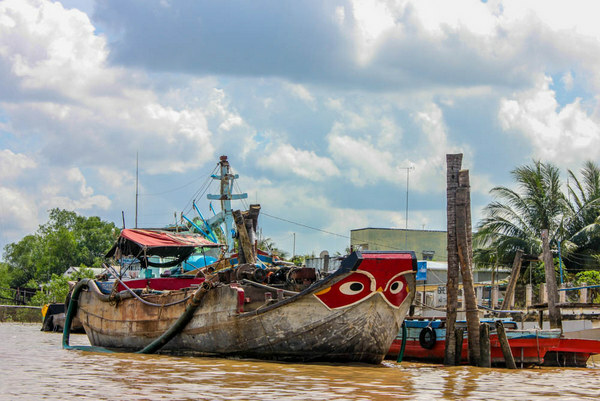 Have you been to the Mekong Delta? Would you want to go? This looks like an incredible journey. From the awesome foodie pictures that even at 9 in the morning are making me hungry, to the slightly scary animal shots, to the simplistic water views, just beautiful. Another world indeed. I totally agree about the journey meaning more than the actual destination. I definitely felt like that on the famous Road to Hana on Maui. Wow that’s seriously scary. I can’t imagine how I’d feel if snakes were just roaming around freely! The night market looks amazing, all that fresh seafood! I agree with you about the alligators, the whole things smacks of tourist entertainment. Interesting journey though! mmmmmmmm seafood. It’s all about those moments eh? When you’re in awe of the place and time you’re in. Cheers indeed! This post makes me miss the Mekong Delta. Love all of the boats and the painted on eyes…. that was one of my absolute favorite parts of my trip there. I got the same response, that it was for luck and to keep the boats/passengers safe (to watch over them). Beautiful photos. I really enjoy that you DIY on this tour. I usually avoid tours while traveling to keep my expenses low. However, sometimes it is possible to miss out on something (like a history lesson). It is awesome how nice and accommodating the Vietnamese were to you. The friendliness and generosity of others can sometimes make the journey way better. Hi Ashley, what an awesome post and ummmm for pho! I really liked Vietnam when I was there a few years ago and I did go on the Mekong Delta. We hired this long boat and slept in a hostel that had freezing cold water and bathrooms that were a 10 minute walk away. The food was fabulous though! Awww alligators :( but the rest looks awesome, especially the crab and the googly eyes. It’s nice to see this area from someone doing it DIY style, as I usually read about package tours. Yeah it was definitely a little bit more of a challenge getting down there DIY-style but it was so worth it in the end. How did you cope holding the boa? Behind the smile it looks like you’re peeing yourself haha. I’m actually not afraid of snakes! But its skin did feel very slippery and weird. And yes, pho is the best! I miss eating it twice a day, haha. OMG I love that pic of you with the boa! Sometimes DIY trips are so much more rewarding; it’s like you’re discovering it all on your own! That’s so true! And I loved being able to explore at our own pace- having a tour guide can make you feel like a herd of cattle being led around, haha. This sounds great! Vietnam is on my list of places to visit in Asia, and reading this just reminded me why! Still haven’t made it to the Mekong, but I plan to rectify that soon. I didn’t find the thought of the group tours appealing, even if they were cheap, so I definitely think you made the right choice by DIYing it. Also, it may be controversial, but I actually prefer bun rieu over pho! It’s all about the crab! To be honest I didn’t even realize there was crab in it… that’s so bad! Love this post Ashley! Also I wonder how long boas live, as I totally held one at a honey farm in the Mekong too 4 years ago! Awesome! Vietnamese coffee is amazing. I always ended up drinking a tad too much though and got way too wired. Like…no bueno. haha. I travelled from Saigon to Phnom Penh on a 2 day one night cruise about 6 years ago and it was one of the best experiences of SE Asia. I loved waving at the kids bathing in the river. Wow, that sounds like an amazing journey! What was the company if you don’t mind me asking? Vietnamese seafood night markets are the best! I went to one on Phu Quoc and everything was so cheap and delicious and fresh. I ate the biggest and best prawns of my life there. I sadly never made it to Phu Quoc but in retrospect it seems I should’ve. And I didn’t know you were scared of snakes! Loved this article! I am definitely planning on visiting the Mekong Delta when i make it over to Vietnam. Did you spend a full month there? Also, that brown chunk in your soup of coagulated blood! I have been living in Thailand for 4 months and it still puzzles me, but different strokes for different folks! Unfortunately no, I only spent two days there! I spent a month in Vietnam though altogether. And actually I’m a big fan of coagulated blood- which sounds weird doesn’t it? One of my favorite foods in France is boudin noir. Wow it looks so exciting! You even played with a python!